This was biscuit #2. I wasn't patient enough to get a picture of biscuit #1...priorities. There's just something about a homegrown tomato. My parent's garden is still producing tomatoes, greens, peppers & even a little okra and thankfully, they are generous enough to share. I woke up this morning thinking about the tomatoes they sent home with me and I immediately wanted a tomato biscuit. I mean, you just can't beat a big ol' slice of tomato on a hot from the oven buttermilk biscuit. I'm thankful I had enough time before leaving for church to enjoy a couple of them. No growling belly interrupting the service this morning! I love tomatoes and it's a good thing I do because we ate a lot of them growing up...well, everyone except my older brother. He's a mater hater! Shameful, ain't it? I guess him not liking them does mean more tomatoes for me though! I'm already dreading the day when the last of the tomatoes will be picked but until then, I will savor every single one that I can get my hands on and count the days until tomato time next year. 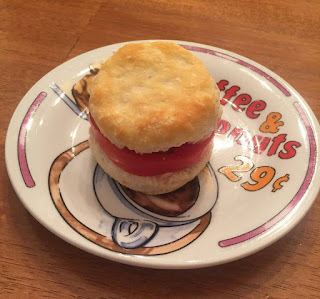 Have you ever had a tomato biscuit?